The Good News: Residential burglaries are down 2 percent in Atlanta so far this year. The Bad News: That small dip follows a 65 percent spike during the three previous years. So reports Terminal Station, an Atlanta real estate blog that has started picking apart Atlanta’s crime statistics. Police Chief Richard Pennington, as you might recall, kept reassuring citizens earlier this year that crime is down, regardless of what they might think. Technically, Pennington is right, if you compare total incidents of serious crime — combining every stolen bike or busted shoplifter with the rapes, assaults and burglaries — in 2008 and 2009. But what does that really tell you? One thing that is lost in the overall numbers that get reported is how specific categories have performed. 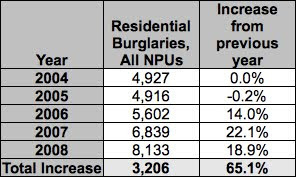 Residential burglaries are up significantly, both city-wide and even more in certain NPUs. From 2004-2008, the number of home burglaries increased 65%. Terminal Station uses lots of charts and graphs to show which parts of town (southeast Atlanta) have shown the sharpest increase in burglaries and where they have actually declined so far this year. An excellent, if somber, analysis that advances discussion of the issue beyond the spin from City Hall. We look forward to future pieces. Good job picking up Terminal Station’s stats. I couldn’t believe the numbers he uncovered. I think even more startling are the shaded maps that show how crime has increased by NPU unit. Various of people blog about this subject but you wrote down really true words! !